by Friedman, Howard S.; Schustack, Miriam W.
You can purchase this loose-leaf print reference to complement REVEL™ for Personality: Classic Theories and Modern Research . This is an optional purchase. 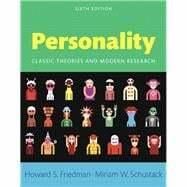 As a companion for REVEL™ for Personality: Classic Theories and Modern Research “personality” is put back into the personality course, integrating the insights of classic theorists with modern research in a manner that will captivate you. Authors Howard Friedman and Miriam Schustack encourage you to think critically about human nature, during the course and beyond. The sixth edition includes updated data as well as examples that reveal how classic discoveries, when paired with modern research, are freshly relevant to current challenges in the real world. Howard S. Friedman is Distinguished Professor of Psychology at the University of California, Riverside, where he studies personality and health. Devoted to teaching, Professor Friedman has received UCR’s Distinguished Teaching Award; the Outstanding Teacher award from the Western Psychological Association (WPA); and most recently, the Elizabeth Hurlock Beckman Award, for “inspiring students to make a difference in the community.” He was honored with the 2007—2008 James McKeen Cattell Fellow Award from the Association for Psychological Science (APS), which recognizes a lifetime of outstanding contributions to the area of applied psychological research. Dr. Friedman is an elected Fellow of the American Association for the Advancement of Science and the Academy of Behavioral Medicine Research, and he is Editor-in-Chief of the Encyclopedia of Mental Health. An honors graduate of Yale University, he received his Ph.D. from Harvard University. Miriam W. Schustack is Professor and Chair of Psychology at California State University in San Marcos (near San Diego), where she currently specializes in individual differences and the use of computers in learning. She has served as a Fellow of the American Council on Education, as Academic Senate Chair, and as Acting Dean. Dr. Schustack was involved in the development and leadership of CSUSM’s Honors Program, and also in the establishment and promotion of Service Learning. An honors and Phi Beta Kappa graduate of Princeton University, Dr. Schustack received her master’s from Yale and her Ph.D. from Carnegie Mellon University. She previously taught at Harvard University. 2. How Is Personality Studied and Assessed? 15. Where Will We Find Personality?